The accommodations clean and of much superior quality to most rentals in my experience. I was largely unaware of the Mendocino area until I began browsing rentals for a Christmas gift for my girlfriend. I ran across options in the area and was lured by the coast, Redwoods, wine tasting, brews and seafood. An escape with amenities. I must say, that was delivered and more, especially with the help of this location! For starters, I believe I snagged this place for an excellent rate; the location is a mere 5 minutes to town, 20 minutes to other attractions and just under 30 to several top notch Anderson Valley wineries. The Hayloft is a flat residing above a garage and features a deck and a balcony, a studio setup with a warm and cozy feel, but sparkling clean. The hot tub helped us to relax with a bottle of local wine beneath the stars after long hikes in the surrounding forest. The biggest surprise had to be the reception from the management company (Mendocino Preferred). There was no one on site, but the personal touches and care were present in every detail. We arrived on a chilly March night, but entered the flat to the comforting glow of soft lighting, and a warm fireplace roaring away. There was an instruction packet that outlined both rules and attractions around the area, including tide charts and trails! They evem left notes around the space informing us of odd quirks on how to open an older window or drawing our attention to the welcoming cognac! This location and management company combined for an awesome experience, and we certainly plan on returning to the area, and this location is at the top of our list. We really loved the Hayloft. It is secluded in the forest but just a few miles from Mendocino and the beautiful coastline. The fireplace was much appreciated. Everything about the Hayloft was comfortable and cozy. We truly enjoyed our time there. We had a very cozy and warm Christmas at the Hayloft!What a great time! I am a repeat visitor and always look forward to and enjoy this quiet, lovely space. It is close enough to town to enjoy the hustle and bustle along with the peace and quiet. I'll be back again for sure. We just returned from a 5 day stay at the Hayloft. The studio rental is located only a short drive (less than 5 minutes) from the town of Mendocino. It is spacious for a studio and very cozy. 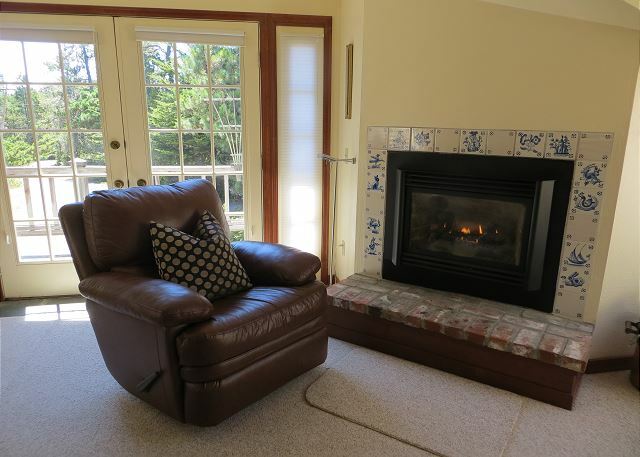 We enjoyed the gas fire place every morning and evening, and relaxed quite comfortably on the sofa and recliner. The full size kitchen has all the pots, pans and utensils needed to prepare your meals. The kitchen window looks out right over the tops of the pygmy forest trees. It truly feels like staying in a tree house! This is our second time staying and would highly recommend addition, the Mendocino Preferred staff are extremely friendly and helpful. We had a wonderful time at the Hayloft, as always. We've stayed here several times. The new hot tub is great! This is the perfect rental for a solo or romantic getaway with the one you love. The apartment is in a very private location surrounded by trees, and although the owner's home is 150 feet away, you feel like they are miles from you. The hot tub is conveniently located on the deck facing the woods, and not the owner's home. The apartment is spotlessly clean, cozy, warm and comfortable. The gas fire place is a real treat when the coast throws it's fog and chill your way. The kitchen is full sized, so you aren't trying to deal with a hot plate and motel sized frig. The bed is very comfortable, and it was almost too quiet to sleep!!! The town of Mendocino is literally minutes away, with it's shops, restaurants, miles of bluffs to walk and extremely friendly people! I appreciated all of the "how to" notes all around the home and the sense of humor that the owners displayed! Green frogs indeed! (Yes, you'll have to go to find out what that means!!!) I loved my stay there and can't wait to bring the hubby back with me the next time. I had a comfortable and quiet stay at the Hayloft. Located on a secluded, wooded property, there was plenty of privacy. Mendocino is just 5 minutes away, along with beautiful sequoia canyons and stunning beaches. The loft has everything I needed to make meals and enjoy my favorite media, along with good wifi signal strength. I especially liked using the hot tub on the deck, with a sky full of stars. 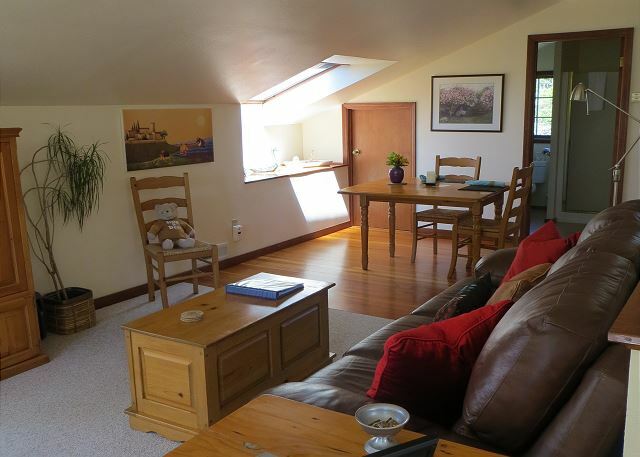 The Hayloft is a very picturesque, private, large studio retreat, perched above a garage. We enjoyed the fully furnished, clean rooms and many amenities (e.g., sunlight inside the rooms, the view of pygmy forest, spa, fireplace, etc. )We have stayed there before but this time we appreciated more the special features, quietness and cleanliness of the retreat. We hope to stay there again. We had a great time in this little cottage, just minutes away from Mendocino. The place was clean, and while the kitchen supplies were sparse, we managed fine. The bed was, at first, uncomfortable, as it's very soft. But by the second night, we were used to it and slept soundly. This was a really cute place and in a good location, close to downtown Mendocino. Very clean and well kept. Best of all we could take our little dog with us. My wife and I had a wonderful stay at the Hayloft. The property is located a few miles outside Mendocino, which made easy day trips up and down the coast. We found the room comfortable and well maintained. It was great for relaxing after a day's outing with a glass of wine on the deck, The property management company was very helpful and made certain that everything was ready for our stay. My husband and I (and our dog) had a wonderful weekend stay here -- lovely! I had a great experience. The house was immaculate, everything as described. Many thanks for the added touches. It was very quiet, yet close to town and the hot tub a real plus after walking around all day. I hope to be back soon. Several great meals in town and wonderful for shopping. We love to come here when we just need a break from our day to day lives. Its quiet and peaceful and the new hot tub is great! It doesn't have an ocean view, but it was quiet, relaxing and perfect! It is close to town, has all the amenities and was a quiet get away. The hot tub any time of the day was wonderful. Plenty of space for two people. My husband and I would recommend to anyone. We love The Hayloft. This was our 3rd time and it was perfect as always. The house is super clean. Nice complete kitchen. The location in the Pigmy forest is lovely. Just minutes from the town of Mendocino or the beach. The Hayloft is the perfect getaway for two. Nice amenities. Great customer service from the rental company. 3rd time is the charm too as he proposed and I said, "yes". We will continue to return to The Hayloft as much as we can. A very special place. The place is charming. This is our home away from home. We love the location, the quietness of the place, the surrounding nature and the bird symphonies all through the day. Perfect quiet cozy private getaway for two. We felt well taken care of by warm friendly available staff. Loved the fireplace and hot tub. We hope to stay here again soon. Second time I've stayed at the Hayloft, and still perfect. The new hot tub was great! We have stayed in the Hayloft for many years. Our stay has always been wonderful. You can count on a consistent, clean, quiet experience. 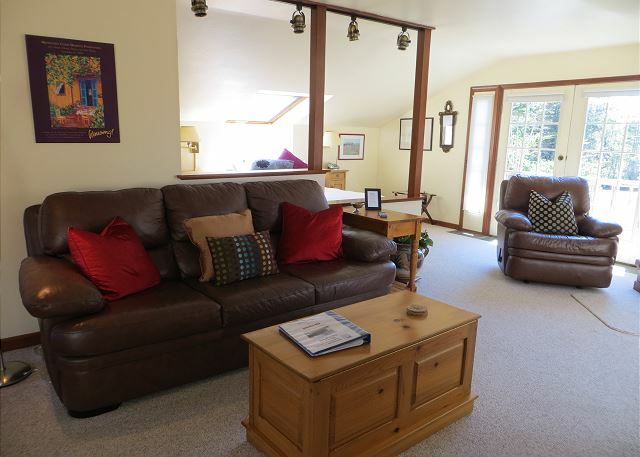 This is a wonderful hideaway just 5-7 minutes from downtown Mendocino! At first we looked for a place in town but was surprised and satisfied with this location - providing a peaceful and quiet location after days either in town or sightseeing along the north coast. The pictures don't really do it justice - the deck is great, small jacuzzi and a cozy living room with fire place. I will stay at the Hayloft again! Located in the forest but very close to Mendocino, this loft behind the owners house (yes the deck is private) fit the bill perfectly. Comfy bed, fireplace, well equipped kitchen, hot tub on deck. Must better than a hotel in my opinion. Would definitely come back. Skylight windows open for a nice breeze if you need that. We brought our own coffee but they had that plus creamer and sugar. Highly recommend this place. The photos were spot on for this lovely retreat. Very private, clean, comfortable and quiet. Only saw the owner once in 3 days. Hot tub is small but certainly comfortable and we used it 4 or 5 times in the 3 days. Perfect size accommodations for 2 people. Will be back for sure. This is our second year staying at the Hayloft. It was perfect for us, a couple with a small dog. 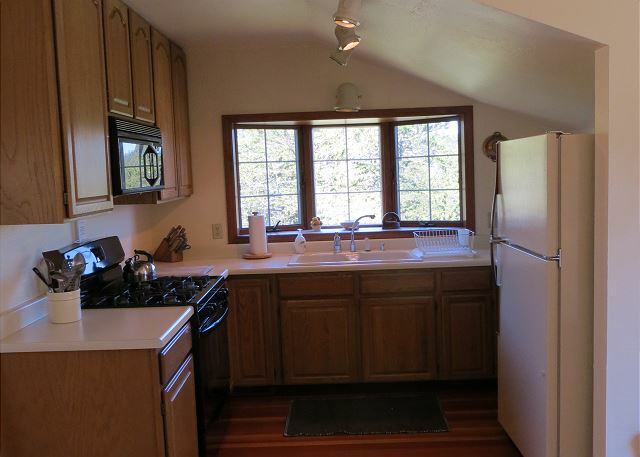 It was spacious clean, light and airy and well located a few minutes from the village of Mendocino. One suggestion: Please place a doggy gate at the top of the stairs so the dog can spend a little time outside without fear of a runaway. We had a very relaxing time in the Hayloft. We slept A LOT and stared at the fire - mesmirizing. Super comfortable bed. It was chilly while we were there and the hottub wasn't super hot, but everything else was wonderful! The loft is conviently located. There was no shampoo or conditioner. So bring your own. Great spot to unwind! Gas fireplace was the highlight as it was stormy outside. Only minor drawback: Hot tub wasn't hot enough. And we look forward to returning soon, nonetheless! Great way to start the new year. Very clean with nice touches throughout. Hot tub was a plus. Would definitely stay again. Pots and pans are limited. The cottage was lovely. We thoroughly enjoyed our stay and hope to return at a later date. We were able to bring our dog which was great. We love visiting the Hayloft. We've been here a number of times and it really feels like a home away from home. We spend a huge chunk of time just loafing around in our bathrobes, drifting between the fireplace and the hot tub. While in Mendocino we did some short hikes along the coast and admired all the beautiful mushrooms. We also did a historical walk in town and learned a lot about the local culture and history. I had no idea so many movies and TV shows had been filmed in Mendocino. One of our favorite restaurants is Cafe Beaujolais, excellent food and great service. We also really enjoyed the Shared Table at the Inn at Cobbler's Walk. The food was delicious and it was really nice to chat with all the other diners at our table. We had a great stay at the Hayloft. It was exactly as advertised. It was private, attractive, and very relaxing. I would absolutely stay there again. Lovely! We enjoyed being off the shore as it was foggy in the coast a lot during our stay and sunny and beautiful at the Hayloft. It had all we needed and was 5 minutes to Mendocino. Our dream home away from home. Great location in the hills above Mendocino. The accommodations were very nice. It was a bonus to be able to take our four legged girl with us. We would book again! Coming to your "hayloft" was a Christmas gift for my sweet, over-worked Man. He is an electrical contractor, specializes in commercial and CA new energy requirements. Unless he leaves home, he does not get a break. Well, both he and I loved our stay. The ambiance is personal, homey, yet very classy. I loved coming and going without having to check in with anyone. The kitchen was so convenient and well-equipped. Our favorite, was the hot tub, which could be a bit warmer, however, under the stars was very memorable. Thank You!!! Great little spot! Very clean and nice. Been coming here for 5 years or so. Always perfect. The owners have been very responsive whenever we've needed anything. Very quiet setting, which is our reason for coming here. Excellent and relaxing stay. Felt somewhat secluded with a perfect distance to nearby Mendocino (which was a plus). Had everything you would need to disappear for a week as we did. Highly recommend. This was a beautiful location. Really quiet and private. The loft was more spacious than I expected, although I would have like a bigger bathroom. Skylights and all the creature comforts made it very nice, and made us feel like guests. There were a few items that needed maintenance, but overall it was very well presented. The one big negative was the hottub. It was a shallow vinyl tub that would not get hot enough. And the bed needed replacing. If the hot tub were fixed, I would definitely stay there again. My husband recently turned 40, and we wanted to spend the weekend somewhere quiet and peaceful. We found the Hayloft to be just what we hoped for, and everything was extremely well prepared. The location is perfect for access to activities in the area, and close to town for dinner, etc. The Hayloft was pristine, well stocked with household items, and there were clear instructions on how to use everything. We loved being able to sit outside in the hot tub and see the stars. Sue & Jim also left a mini-poster to wish my husband happy birthday, which was a personalized touch you definitely don't get at even a nice hotel! We wished we stayed a week longer, and would love to go again. Overall, I am happy with our stay. There were a few disappointments. The fireplace did not work. There was not enough water in the tiny hot tub, so if you turn the jets on you have to wait for them to turn off (on a 20 min timer) before you can get out, as the instructions state you can't have the water line below the jets when they are on. Our stay was only two days, so I didn't want to bother with calling and waiting for someone to come out and fix these no fireplace and limited hot tub use. Bummer. The place was clean and cute. The staff was friendly. There were plenty of towels, which was nice. It would be good if there was a few games or even just a deck of cards or something. Not going to fault them for this, just saying it would have been nice. The description says that this is very secluded, but after you pay you are notified that it is actually a guest house and very close to another home. It does FEEL secluded, but that is not the same as being secluded. It didn't bother me too much, but I felt like I was being tricked since this was not in the description of the place before you pay. This was our 4th year celebrating my boyfriend's birthday at the Hayloft. Cozy, romantic, quiet, clean. We especially love the personal touches that adds to the experience. We'll be back next year. 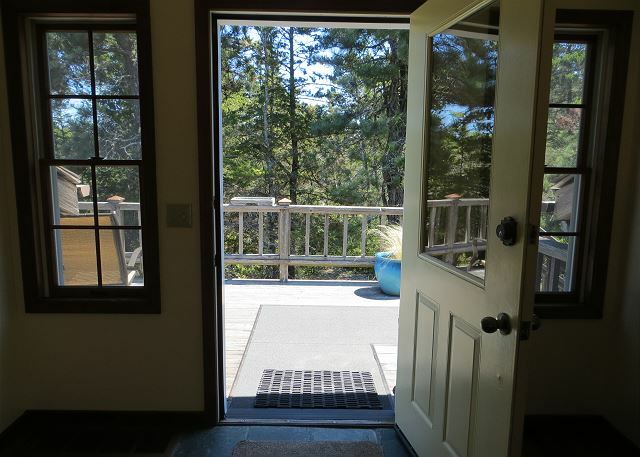 Quiet, private retreat just a few miles from Mendocino! Beautiful cozy interior! Would definitely like to visit again! Unfortunately, the hot tub had to be drained for maintenance the morning before arrival and was refilled with cold water rendering it nearly too cold to use for 1 out of 2 nights. Too bad maintenance did not fill it with pre-heated water. Me and my girlfriend stayed here for the Labor Day Weekend and our experience was phenomenon. The best part of the whole experience was when we got to the Hayloft after driving from San Francisco through Point Reyes and Bodega Bay to Mendocino (which is highly recommended), we arrived at around 1030 PM in a semi warm night and we saw that all the lights are on there is Brandy ready for us and the HOT TUBE is on and super warm with a beautiful night sky. Mendocino is a great vacation spot but we wanted nature and privacy which that was what we got. We spent a lot of time at the house cooking and enjoying the hot tube and unfortunately didn't get to thank Sue and Jim for their great hospitality in person, so thanks for making this experience great and we will be back. To escape city's busy life, my husband and I love this little guest house for our yearly getaway. We've been to this location several times and it is consistent with cleanness and maintenance. Full kitchen with all you need to stay in. We are so spoiled in SF with excellent restaurants that going out is not an objective of our stay. Still we have our favorites: Patterson Pub, Mendocino Cafe and Frankie's Ice cream. We enjoyed the beautiful setting and tasteful, well-appointed cabin in the pygmy forest. We have rented from Mendocino Preferred many times, and find them friendly, helpful, and willing to go out of their way to help. The same goes for our hosts of the Hayloft! When we think back to our several days in Mendocino at The Hayloft, we have happy sighs. What a lovely getaway - everything we needed. The owners were very thoughtful. The simplicity added such charm, and was the wonderful contrast that makes a vacation what it should be - relaxing. The quiet and solitude were best enjoyed from the hot tub. So close to a charming town, multiple beaches and beautiful nature. We can't wait to go back. We had a very relaxing vacation at the Hayloft. Very clean. It was quiet and peaceful. We enjoyed the hot tub as well. Beautiful get away. My wife and I recently celebrated our 44 anniversary and thoroughly enjoyed our three day stay at the Hayloft. The unit is charming and the owners have put a lot of thought into all of the details. Would definitely return. What a great place to stay when visiting the Mendocino area. It is very private, with a lovely deck overlooking a pygmy forest. The place was very clean, and the owners were incredibly thoughtful in the items they provided (including the brandy!) Mendocino is only a short drive away, along with a number of other great parks for walking or biking. We love this place! Just a short drive to the beach, cozy, lots of natural light and just above the tree line so while enjoying the hot tub there's a sky full of stars above. We will be back. We love this place. It's ideal for us because it provides intimacy and peace that we always seek. It feels like home. Our visit was perfect. We had a fireplace and a hot tub, so unwinding was easy. Being able to cook for ourselves is a nice option, too. This allowed even more relaxation because some days we didn't even have to change out of our bathrobes. For one outing we toured Big River on a canoe with a guide. I highly recommend that trip! Terrific little place. Every detail was perfect. We really did not want to leave at the end of the weekend. We would definitely come back. I suppose if I had to find a complaint, it would be that there aren't any good movies on the satellite plan they have. I suppose you could rent a DVD in town if you really wanted to. Instead of TV, however, bring an instrument, bring a book of poems, enjoy the hot tub, make food, etc! The view from the hot tub at sunset across the pygmy forest is pretty sweet. I wish we lived there. We have stayed here every year for about 5 years. It's not on the ocean, but it's secluded and quiet. Sitting out in the hot tub over looking the pygmy forest is one our favorite places to be. It's so peaceful and you are just minutes from town. Jim and Sue make sure everything is perfect. It is a flat above the garage, but it doesn't feel like it. The way it's orientated, you feel like your by yourselves. I've been coming to the Mendocino area for 30 years and I think it's one of the best values in the area. Beautiful location - pygmy forest view all to yourself in the hot tub. Very close to town and beaches. 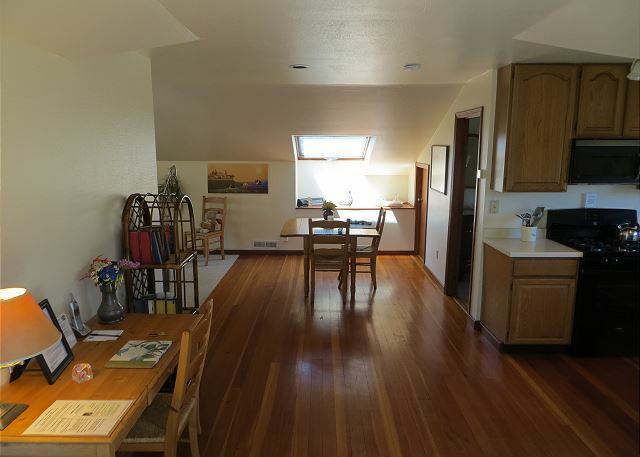 Cute and cozy loft, comfortable, clean, sparse but has what you need for simple living. As described, with accommodating hosts who live on the property. Loft is private as its own structure. This was our second visit and it was very relaxing. It's nice to have a kitchen so you can cook (or not) and stay in pjs all day. The ready use of the hot tub was a welcome addition to the day. Bed, fire, hot tub... what more do you need for a perfect getwaway? 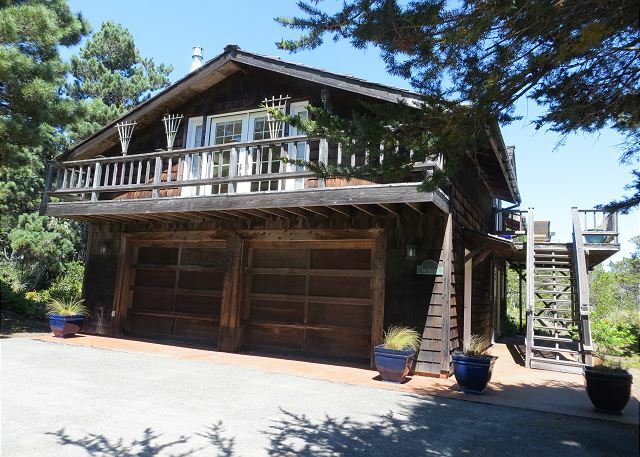 Beautiful respite close to downtown Mendocino! Everything in the house was immaculate, very much as pictured. The hot tub was private, bed was comfortable, and the kitchen is nicely stocked if you want to cook. It's so beautifully quiet out there, just a pleasant place to sit and read. We brought bikes, and it was an easy ride to beautiful downtown Mendocino and very close to attractions like the glass beach and bowling ball beach. The hosts were fantastic, supplied us with many great recommendations on restaurants and local activities. Perfect little getaway. We loved our short stay at the Hayloft! The studio itself is immaculate, nicely appointed, comfortable, larger than it looks in the pictures, and has three skylights your can open for air circulation. The hot tub is situated to overlook the Pygmy forest and is completely private. The Hayloft is tucked back away from any busy streets while being only a few miles from Mendocino. We loved waking up, making our coffee and breakfast and relaxing before we headed out for our day. We highly recommend the evening kayak bird watching tour at Liquid Fusion Kayaks in Ft. Bragg as well as the Mendocino Botanical Gardens (plan to spend several hours there). We will definitely return to The Hayloft for our next visit to Mendocino. After an extremely hectic summer, the Hayloft was exactly what we needed. Location is just right. Not too far from town, but far enough from the tourists. Loved the surroundings and the peace and quiet. Especially appreciated the use of the phone. Thank you that was very thoughtful. Look forward to visiting next year for the Music Festival. We were able to enjoy a couple of fantastic events. Pretty much as advertised. Quiet and conveniently juxtaposed to Mendocino. We had a wonderful time staying at The Hayloft in Mendocino. Loved the pigmi forest nearby and the peace and quiet. The interior of the home was charming with sufficient amenities to provide a most comfortable stay. We love everything about this place and we will be back. LOVED the hot tub!!! got to sit and look at the stars while soaking!!! so quiet and peaceful! This is my second stay at this rental property and won't be my last. I plan to make this a yearly getaway. So peaceful and tranquil, perfect place to completely disconnect from it all.